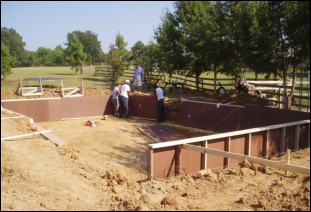 Our system can help you create a NEW pool at a fraction of the cost of other construction methods. Just follow the steps below to create your new pool. 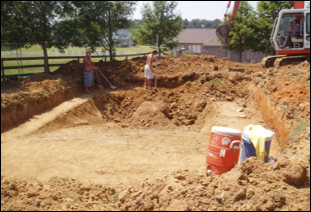 Construct a POOL for ½ the PRICE in ½ the TIME! Our process is simple: Design, Dig a hole, wood framing construction (steps can be added at any time), 2 inch minimum concrete floor, attach hydro mat (2-3 layers), each layer soaked/bonded with primer resin, sand between coats to ensure proper chemical and physical bond and apply color @ 20 mils per coat. That’s it! No re-bar – No excessive cost for concrete. No waiting for a crane ($600.00 to $1,000.00), no shipping ($1,500.00), and no cost for a manufactured pool ($5,000 to $14,000.00). 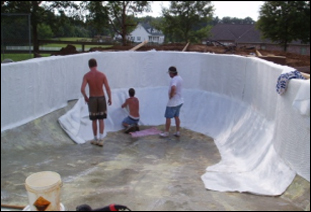 We build nearly indestructible pools with our 100% Solid Reinforced Titanium Polymer Primer Bond Coat with an incredible 5500 psi bond – 100% Solid Reinforced Titanium Polymer Color Top Coat with 14,000 psi chemical bond strength and will etch itself into the surface up to ¼ inch. Integrate our revolutionary hydro mat with polymer string enter woven in the mat, making it the strongest mat made, and you now have the world’s strongest 100% waterproof titanium shell! 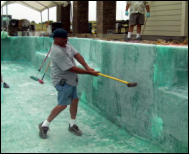 One layer of hydro mat is stronger than 3 layers of woven, which is used in the molding of in-ground fiberglass pool. Rating for 3 layers of hydro mat is 150,000 psi flexible strength. Our New Build System is Newlander Armor Products industrial grade material, which is 10 times stronger than the pool industrial codes. One layer of our matting is equal to 2 ft. of concrete and is 17 times more flexible than concrete. 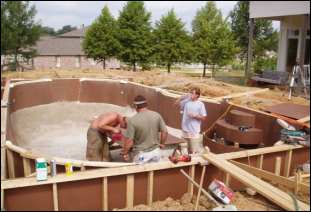 Our pools are five times stronger than any one piece fiberglass pool. 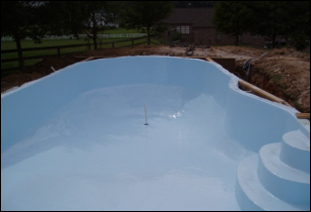 Conventional fiberglass one piece pools will eventually break down and have problems. Do not be misled. Super Epoxy Products are 100% Green – Environmentally safe resins and hardeners made from raw materials such as Flora Microbial Oil, which will replace our soybean formula for the resins. All of our products contain Microbans and New Nano Technology. 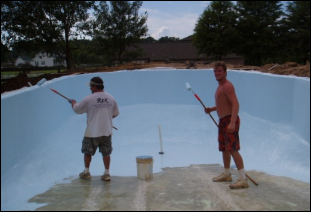 LIFETIME STRUCTURAL GUARANTEE that your pool will never peel, flake, chalk, blister, crack or delaminate! We believe in our system so much you can hit it with a sledgehammer to prove it! 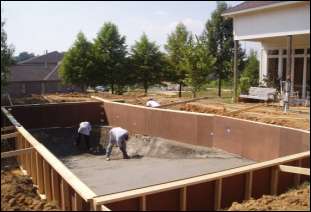 Depending on the circumstances of where your pool is being built you have the option to build with 18 oz. Biaxial or 1½ oz. stitch mat. Do not be misled. We educate, do the testing, which most companies cannot afford, and even teach you “how to”. If you are considering any other alternative, I challenge whom ever to meet our test standards and prove with real, factual certified data that the product performs as stated. 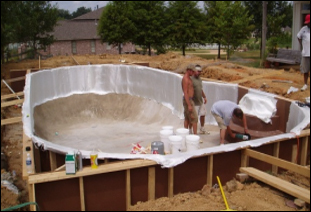 We build you an impervious monolithic epoxy shell that will permanently stop water and hold water. Our new build system is high-performance thermosetting epoxy resin that is reinforced with state-of-the-art proprietary titanium fillers and modified flex enhancers for increased physical strength, chemical resistance and superior bonding properties. Our products are manufactured by a company with over 20 years of experience in the research and development epoxy coatings and linings for industrial and pool applications. With our product you could hit it with a sledgehammer and it would not be affected. Concrete can be destroyed with just a small hammer. 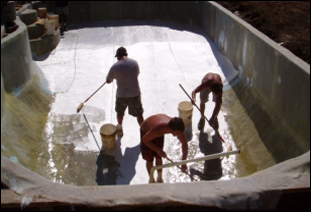 Build your own in-ground epoxy pool. We are looking for distributors, sales associates and applicators nationwide. We can train you on your next project as a “hands-on” training seminar. Pre-fab panels can be made to fit on a shelf or Luan sheeting can be fastened to framing. Panels can be constructed to any size or shape. Minimum 2” slab of concrete poured. Downgrade is established by framework expansion. Build a box for efficiency of cost, labor and materials. Shape of pool such as radius, benches and steps can be installed after with little effort and precision. 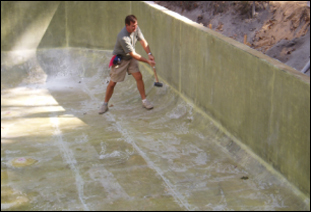 Pool interior is primer bonded. Stitch mat installed in three layers. 1st in a strapping direction, 2nd in banding direction and 3rd is strapping direction. Stitch mat w/primer bond is the pools strength. 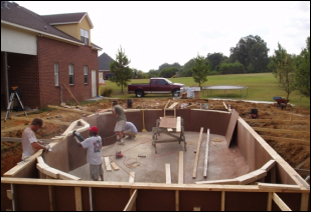 Our system is the fastest, strongest and most affordable solution to conventional pool construction. Colors options are available in any color possible. Non-skid is broadcast on steps of final coat. Residential pools with smaller accommodations can be completed in an expedited rate. The pool can be back-filled in 2 days and filled with water in 48 hours.